Conversations with the entrepreneurs behind some of today's newest and most innovative food brands. Inspired by the principles of Ayurveda, longtime yoga practitioner and foodie Josh Ehrenfried sought out to create a cleaner, less sweet food bar that could also be eaten to balance one’s mind and body type. Dosha Bar is a mindful snack bar made with organic, unsweetened fruit and seeds – no artificial or added flavorings, no fruit juice concentrate, no preservatives and no powders from a lab. Available in three yummy flavors, Dosha Bar is intended to offer a clean, tasty snack with honest ingredients by harnessing the power of Ayurveda, the ancient Indian wellness system. In my conversation with Josh, you’ll learn: How Dosha Bar is helping people discover Ayurveda through food Where Josh found the best bang for his buck when it comes to scaling his business What goes into building a strong brand identity that customers genuinely resonate with The biggest challenges for better-for-you food brands in today’s industry Where Josh thinks the food industry has room to improvement Want to try Dosha Bar for yourself? Make sure to listen through the end of the episode to learn how you can save 20% on your order. Opportunity Is Everywhere – Taking Something Great and Making It Even Better With Country Archer Jerky Co. When it comes to starting a business, it isn’t always about inventing something completely different. In fact, some of the most successful brands out there built their empires by finding an opportunity to take something that already existed and make it just a little better. For Eugene Kang, the co-founder of Country Archer Jerky Co., that opportunity presented itself during a road trip to the Grand Canyon, where he and his now business partner met Celestino “Charlie” Mirarchi, a butcher and artisan jerky maker who made small-batch jerky by hand and sold it roadside throughout the Southwest. “It was the most out-of-this-world, mouthwateringly delicious jerky we had ever tasted,” said Kang. “I knew nothing about jerky - or business for that matter - but did know that if I could just package this in the right way, source super clean ingredients, and create a strong brand behind an already amazing product, that everyone from young ingredient-conscious consumers to parents and beyond would take pride in picking Country Archer up off the shelf and sharing with others.” Twenty-five thousand stores and 155 employees later, I’d say Eugene was definitely right. In our conversation, you’ll learn: How he helped scale Country Archer into one of the biggest artisan beef jerky companies on the market How he and his business partner were able to build a brand identity that spans across age demographics and lifestyles. What initially inspired Eugene to start his own business His advice for new entrepreneurs You can learn more about Country Archer Jerk Co. at countryarcher.com. You can also get in touch with me at adriagreenhauff.com. What do you get when you task three food loving grad students from Portland with coming up with an idea for a business — you get a food company that’s equal parts flavor and personality. Red Duck Foods is an artisan organic condiment company located in Portland, Oregon.. Now a Certified B Corp®, Red Duck has 11 certified organic products including four ketchups, three BBQ sauces, three taco sauces and a cocktail sauce. On the podcast today, I’m chatting Jessica Hilbert, one of the three amazing women who started this very unique brand. In my conversation, we talk about: -How Jessica and her co-founders have built a business around making food more fun -How she and her team raised $25,000 to get Red Duck Foods off the ground -How Red Duck Foods is leveraging partnerships to scale their brand and gain new customers You can learn more about Red Duck Foods at redduckfoods.com. You can also get in touch with me at adriagreenhauff.com. Elena Ladoux was a busy attorney and mom juggling a demanding career and home life. Determined to “have it all,” she went on a search for a natural product that would help give her a boost of energy and focus on the days she needed it most. But after years of research and still coming up empty handed, she did what any determined mom would do – she created something herself. MommyGo is a healthier and gentler alternative to the traditional energy shot. Made with ceremonial grade Japanese matcha tea, MommyGO provides hours of calm alertness to power your presence when it matters most. It is packed with antioxidants, is low on sugar and 100% natural. In my conversation with Elena, you’ll learn: How she’s built a successful company around the mission of helping moms “have it all” How she leveraged her personal social media network to get MommyGo off the ground How she went from a litigator to running multiple businesses (that’s right, MommyGo isn’t her only venture) Plus, why she thinks her lack of formal business education has made her a better entrepreneur ... and so much more. You can learn more about MommyGO at mommygo.co. You can also get in touch with me at adriagreenhauff.com. As a health coach, Allyson Straka, the CEO and Chief Smoothie Officer of Frozen Garden, was frustrated hearing her clients complain they didn't have time to cook from scratch at home and there were no healthy and convenient products at the grocery store. That’s when a lightbulb went off and Allyson decide that she would fill the gap in the average American diet by creating a complete nutrient dense and convenient smoothie solution without any powders, supplements or gimmicks. Frozen Garden makes frozen ready-to-blend green smoothies that are handcrafted using 100% whole fruits, vegetables, seeds and spices. Each pouch makes one 20oz smoothie when blended with water. Yep, all you need to do is add water and blend! In my conversation with Allyson, you’ll learn: How Frozen Garden went from idea to successful business How Allyson and her team are supporting local farms in the Midwest Allyson’s secret to blending the perfect smoothie … and so much more. You can learn more about Frozen Garden at thefrozengarden.com. You can also get in touch with me at adriagreenhauff.com. It’s no secret that meal kits are major disruptors in today’s food industry. From meal kits to weekly lunch and dinner options delivered fresh to your door, there has never been more healthy food options available with just a few clicks – and without every having to leave your house. Nurture Life is a healthy meal delivery service specifically designed for babies, toddlers and young children. The brand’s co-founder, Jennifer Chow, came up with the idea after experiencing the time consuming and often stressful process of cooking fresh, wholesome meals for her young son. On this episode, Jennifer and I chat about: How she went from being a marketing exec for the tech industry to running her own food business How Nurture Life is disrupting the rapidly growing segment of healthy food delivery How this company has built a brand that parents love and trust What the first year of business is really like for a new food company … and so much more. You can learn more about Nurture Life at nurturelife.com. You can also get in touch with me at adriagreenhauff.com. How do you enjoy eating out at restaurants when your job – and livelihood – require you stay in shape? That’s the question that led food entrepreneur Julia Kravets down the road to starting her own business. Little Choc Apothecary is the first fully vegan and gluten-free crêperie in NYC, offering a creative selection of sweet and savory crepes and homemade baked goods, as well as a selection of coffee, teas, vegan wine and beer and freshly pressed juices. In my conversation with Julia, you’ll learn: How she went from a career as a fashion model to launching her own business How Little Choc is staying true to its mission of making healthy and cruelty-free food that’s also delicious What food trends Julia has seen catching the attention of New York City’s health conscious foodies We also talk about Julia’s personal journey and why she ultimately chose to embrace a plant-based lifestyle. You can learn more about Little Choc Apothecary by visiting littlechoc.nyc. You can also get in touch with me by visiting adriagreenhauff.com. This is episode 13 of the Better Food Stories interview series, which includes conversations with the entrepreneurs behind some of today’s newest and most innovative food brands. When Theo Lee started his MBA program at the UCLA Anderson School of Management, he had an idea that someday he might start his own company. But his road to entrepreneurship turned out a little different than he imagined. Lee’s company, KPOP Foods is the newest brand helping people discover and enjoy Korean food and flavors. The L.A. startup, which started off as a grad school project, creates deliciously authentic Korean sauces, mayos and sea snacks. In my conversation with Theo, you’ll learn: -How his grandmother inspired him to start a food company paying homage to his heritage -The role that crowdfunding played in getting KPOP Foods off the ground -What Theo and his team are doing to educate consumers about Korean culture and cuisine, all while building a supportive community of brand advocates. You can learn more about KPOP Foods by visiting kpopfoods.com. You can also get in touch with me by visiting adriagreenhauff.com. 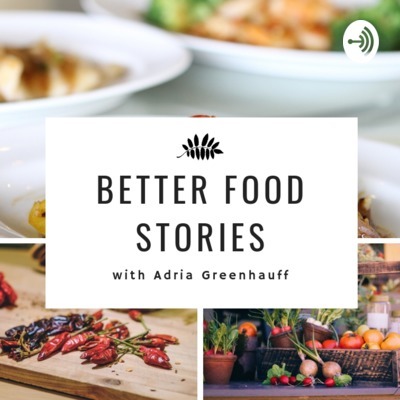 This is Episode 12 of the Better Food Stories interview series, which includes conversations with the entrepreneurs behind some of today's newest and most innovative food brands. I'm Adria Greenhauff, a South Florida-based food and hospitality copywriter, and I recently sat down with Samantha Abrams, founder Emmy's Organics, a gluten-free, vegan and organic snack company that has expanded from Samantha's home kitchen in Ithica, NY, into a multimillion dollar healthy snack empire. You can learn more about Emmy's Organics by visiting emmysorganics.com. You can also get in touch with me by visiting adriagreenhauff.com. Episode 11: The Art of Speciality Coffee Roasting with Tinker Coffee Co. This is Episode 11 of the Better Food Stories interview series, which includes conversations with the entrepreneurs behind some of today's newest and most innovative food brands. I'm Adria Greenhauff, a South Florida-based food and hospitality copywriter, and I recently sat down with Stephen Hall, co-founder and CEO of Tinker Coffee Co., a speciality coffee roaster located in Indianapolis. Make sure to stick around to the end of the episode to learn how to score a discount for Tinker's monthly coffee subscription, which give you access to amazing (and pretty exclusive) coffee delivered right to your door every month. You can learn more about Tinker Coffee Co. by visiting tinkercoffee.com. You can also get in touch with me by visiting adriagreenhauff.com. This is Episode 10 of the Better Food Stories interview series, which includes conversations with the entrepreneurs behind some of today's newest and most innovative food brands. I'm Adria Greenhauff, a South Florida-based food and hospitality copywriter, and I recently sat down with Claire Smith, founder of Tenera Grains, a brand that's changing the way we all eat granola with their signature Teffola recipes made with teff, a naturally gluten-free grain popular in Ethiopian cuisine. You can learn more about Tenera Grains by visiting teneragrains.com. You can also get in touch with me by visiting adriagreenhauff.com. This is Episode 9 of the Better Food Stories interview series, which includes conversations with the entrepreneurs behind some of today's newest and most innovative food brands. I'm Adria Greenhauff, a South Florida-based food and hospitality copywriter, and I recently sat down with Meg Barnhart, co-founder of The Zen of Slow Cooking, a brand of single-use slow cooker spices with a social mission to create more sustainable employment options for any adults who has a developmental disability. Listen to find out how she went from idea to successful business. You can learn more about The Zen of Slow Cooking by visiting thezenofslowcooking.com. You can also get in touch with me by visiting adriagreenhauff.com. This is Episode 8 of the Better Food Stories interview series, which includes conversations with the entrepreneurs behind some of today's newest and most innovative food brands. I'm Adria Greenhauff, a South Florida-based food and hospitality copywriter, and I recently sat down with Dr. Janice Elenbaas, founder of Lucky Dog Cuisine, a company that makes cooked, people-quality food for dogs. Listen to find out how she went from idea to successful business. You can learn more about Lucky Dog Cuisine by visiting luckydogcuisine.com. You can also get in touch with me by visiting adriagreenhauff.com. This is Episode 7 of the Better Food Stories interview series, which includes conversations with the entrepreneurs behind some of today's newest and most innovative food brands. I'm Adria Greenhauff, a South Florida-based food and hospitality copywriter, and I recently sat down with Reid Pearson, founder of HeroFuel, a sports bar designed specifically for child athletes. Listen to find out how he went from idea to successful business. You can learn more about HeroFuel by visiting shopherofuel.com. You can also get in touch with me by visiting adriagreenhauff.com. This is Episode 6 of the Better Food Stories interview series, which includes conversations with the entrepreneurs behind some of today's newest and most innovative food brands. I'm Adria Greenhauff, a South Florida-based food and hospitality copywriter, and I recently sat down with Emily and Antony Bartlett, co-founders of Real Plans, a meal-planning app that lets you easily customize menus based on family size, food preferences, food allergies and even specific diets. Listen to find out how they went from idea to successful business. You can learn more about Real Plans by visiting RealPlans.com. You can also get in touch with me by visiting adriagreenhauff.com. This is Episode 5 of the Better Food Stories interview series, which includes conversations with the entrepreneurs behind some of today's newest and most innovative food brands. I'm Adria Greenhauff, a South Florida-based food and hospitality copywriter, and I recently sat down with Sara Gotch, founder of Gnarly Pepper, a line of custom herb and spice blends offering a healthier alternative to mayos and dips. Listen to find out how she went from idea to successful business. You can learn more about Gnarly Pepper by visiting GnarlyPepper.com. You can also get in touch with me by visiting adriagreenhauff.com. This is Episode 4 of the Better Food Stories interview series, which includes conversations with the entrepreneurs behind some of today's newest and most innovative food brands. I'm Adria Greenhauff, a South Florida-based food and hospitality copywriter, and I recently sat down with Samad Nasserian, founder of the Cozymeal, an online marketplace that connects people with top chefs for high-quality cooking classes and unforgettable culinary experiences. Listen to find out how he went from idea to successful business. You can learn more about Cozymeal by visiting Cozymeal.com. You can also get in touch with me by visiting adriagreenhauff.com. This is Episode 3 of the Better Food Stories interview series, which includes conversations with the entrepreneurs behind some of today's newest and most innovative food brands. I'm Adria Greenhauff, a South Florida-based food and hospitality copywriter, and I recently sat down with Derin Alemli, founder of the Chicago-based fast casual restaurant Square Roots Kitchen. Listen to he from idea to successful business. You can learn more about Square Roots Kitchen by visiting SquareRootsKitchen.com. You can also get in touch with me by visiting adriagreenhauff.com. This is Episode 2 of the Better Food Stories interview series, which includes conversations with the entrepreneurs behind some of today's newest and most innovative food brands. I'm Adria Greenhauff, a South Florida-based food and hospitality copywriter, and I recently sat down with Ann Foley, co-founder of all-natural instant matcha tea powder company 10th Avenue tea. Listen to learn how she and her business partner went from idea to successful business. You can learn more about 10th Avenue Tea by visiting 10thavenuetea.com. You can also get in touch with me by visiting adriagreenhauff.com. This is Episode 1 of the Better Food Stories interview series, which includes conversations with the entrepreneurs behind some of today's newest and most innovative food brands. I'm Adria Greenhauff, a South Florida-based food and hospitality copywriter, and I recently sat down with Ori Zohar, co-founder of artisanal spice brand Burlap & Barrel to learn how he and his business partner went from idea to successful business. You can learn more about Burlap & Barrel by visiting burlapandbarrel.com. You can also get in touch with me by visiting adriagreenhauff.com.